With Coupon Codes From Promocodes.com You Can Find Your Artistic Inspiration Without The High Price Tag! Here you’ll find a comprehensive list of discounts and promotions relating to your favorite arts and crafts suppliers. Just a few of these stores include Hobby Lobby, Michaels, Joann Fabrics, and many more! These vendors offer a variety of arts and crafts supplies including: stationary, paint, sewing supplies, beads, frames, labels, stickers, gift wrapping supplies, greeting cards, etc. Artists can use these materials to express themselves with endless projects or keep the kids entertained with educational games and crafts. Works sitewide and includes free shipping. Enter this coupon code to get $5 off on orders of $50 or more + Free Shipping on orders of $50 or more. Find the largest selection of fabric in unique prints and materials at Online Fabric Store. Works sitewide. Apply this promo code to get 10% off all orders at at BEST BEE BROTHERS. Save your home from the destruction of carpenter bees with innovative bee traps! Enter this promo code to get 25% off FedEx Econo & Ground Shipping when you spend at least $50 at PaperMart.com. Receive 20% off A Course for first time users. Works sitewide. Enter this coupon code to get 10% off all orders at A Cherry on Top. Activate extra savings on your craft supplies! Receive 10% off on purchases when you sign up. Works sitewide. Apply this code to get $5 off orders of $59 or more. Works sitewide. Get 10% off on any order when you enter coupon code. Solidify your thoughts on paper with some flair whether you are writing, note-taking, sketching, drawing, or coloring. Works sitewide. Reveal this coupon code to get $5 off on orders of $45+ at Jerry's Artarama. Works sitewide. Apply this code to receive 10% off your order of $45 or more. Apply this coupon to get up to 40% off on Select Items. Apply this coupon code to get FREE 30-Day Trial Subscription + 1 Class Credit. Get Free Wine Bottle Projects when you sign up. With Coupon Codes From Promocodes.com You Can Find Your Artistic Inspiration Without The High Price Tag! With Promocodes.com exclusive coupon codes you can get inspired without the high price tag! Here you’ll find a comprehensive list of discounts and promotions relating to your favorite arts and crafts suppliers. Just a few of these stores include Hobby Lobby, Michaels, Joann Fabrics, and many more! These vendors offer a variety of arts and crafts supplies including: stationary, paint, sewing supplies, beads, frames, labels, stickers, gift wrapping supplies, greeting cards, etc. Artists can use these materials to express themselves with endless projects or keep the kids entertained with educational games and crafts. These crafts range from simple to complex, which means you are sure to find something that is the right fit for you! With these art supplies, you can unwind after a stressful day, or add to your DIY collection with a creative outlet that will put your mind at ease. These arts and crafts are also an easy way to brighten up your home with a personal flair, or use them to create a gift that will stand apart from the crowd. Aside from adorable costumes and an action-packed evening of trick-or-treating, there are a lot of cute, fun Halloween activities you can do with your kids to get in the spirit of the holiday. Have you heard about the Michael's Challenge? 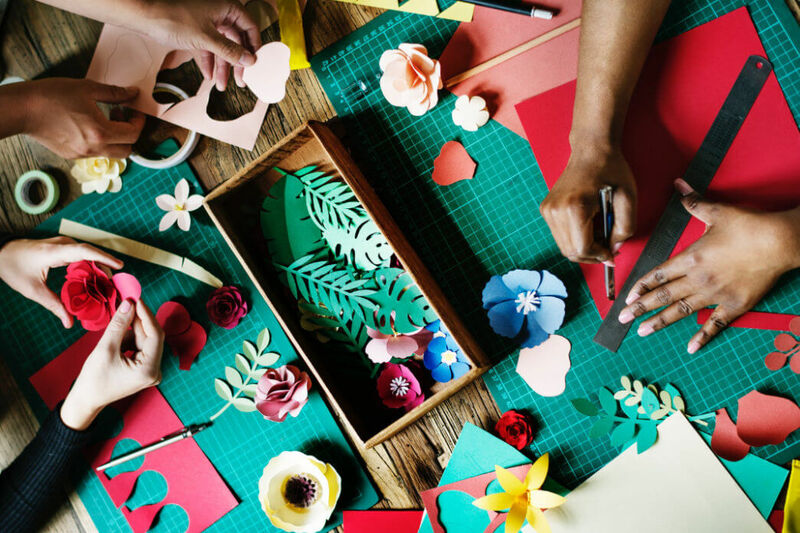 The largest arts and crafts retailer in the U.S. is calling on social media enthusiasts to share their most creative portraits - all shot right inside a Michael's store. If you’re an enthusiastic DIY-er or if your kids love to create new masterpieces, you need these project ideas that will keep you from spending a fortune on crafts.